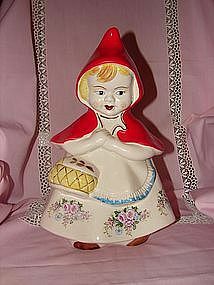 McCoy Little Red Riding Hood cookie jar. Aside from minor crazing in mint condition. About 14 inches tall and 9 inches around. I have been told that McCoy didn't make a little red riding hood cookie jar. This piece is clearly marked on the bottom with a authentic McCoy mark and is such a beautiful old piece. I am no expert, but, it sure looks like a McCoy piece to me. Buy it with me not knowing positive. If it is McCoy then this is truly a real find. I do know it is not a Regal/Hull. I did research that.